Linnaeus one day received a letter from ”the dead”. It was written by Peter Forsskål, one of Linnaeus’ pupils, who had died a year before the letter reached Uppsala. Forsskål had travelled to explore Yemen, a country called ”the happy Arabia”. Peter Forsskål was born in Finland but his family had moved to the county Uppland in Sweden. Already at the age of 10 he was registered as a student at Uppsala University. After some time he met Linnaeus and was fascinated by science. 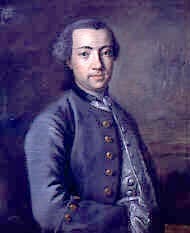 Forsskål had the opportunity to join a Danish expedition to Yemen in 1760. As travel companions he had some educated men selected to explore this unknown part of the world. One of the goals was to find out more about the plants mentioned in the Bible. It took two years before the expedition reached Egypt, and then they sailed on along the Arabian coast of the Red Sea. From there they made expeditions inland. Forsskål collected many plants new to science and took notes of everything he saw. He found, among other things, the much discussed balm tree that was known from the Genesis in the Bible. After a year in Yemen, Forsskål caught a fever that killed him. He was only 31 years old when he died and Linnaeus mourned his young student. He named one of the plants Forsskål had sent home Forsskaolea tenacissima, because it was as stubborn and persistent as Forsskål himself.